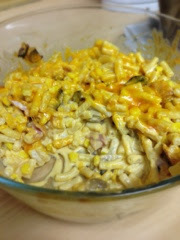 Slimming World Diary: SW Macaroni & Cheese .. This is a variation of mac and cheese I found. The whole dish serves 4 and is 3.5 syns if using your HeA for the cheese. It was gorgeous and creamy just what I needed, I put a little bacon, mushroom and sweetcorn in to make it a little different. It's a real feel good meal. Here's how I made it. 2. Cook the macaroni according to packet instructions, while doing this fry the bacon and mushroom in some Frylight until the bacon is golden and the mushrooms are cooked. 3. Mix the Philadelphia with the milk and half the cheddar cheese. 4. Drain the pasta and return to the pan, stir in the Philadelphia mixture, bacon, mushrooms and the sweetcorn, then transfer to an oven dish. 5. Top with the remaining cheese and bake in oven for 20 mins until cheese has gone golden.